EasyExportMail can help you manage project teams, business meetings, marketing, tournaments messages efficiently. 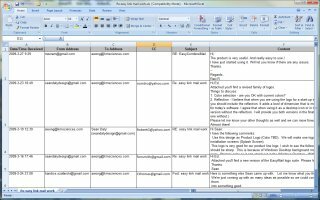 With this software you can group the replies and export the contents to one Excel spreadsheet, while removing all duplicates removed. It exports any selected emails to Excel. If you are an organizer of projects, activities, help desk, technical support, clubs, manage teams and interest groups. This tool will save you a lot of time. EasyExportMail exports any selected emails to Excel. ...... After you sent out an invitation or survey to a group, you will receive a large number of email replies. You will have to open each email and copy the email contains into a working document. With EasyExportMail, simply select the emails and then click the 'Export to Excel' button your emails will be exporting to Excel and duplicate email entries are removed automatically. The exported emails will be organized in chronological order in columnar format. No more cut and paste. You can then add your comments by inserting additional columns or send the spreadsheet to anyone. You may also append any number of emails to an existing spreadsheets that were created by EasyExportMail. This function simply updates the spreadsheet with the new email units which are not already present. The columns you have inserted will not be altered or removed after the export. This software supports Microsoft Outlook 2003 and 2007. Qweas is providing links to EasyExportMail 19.95 as a courtesy, and makes no representations regarding EasyExportMail or any other applications or any information related thereto. Any questions, complaints or claims regarding this application EasyExportMail 19.95 must be directed to the appropriate software vendor. You may click the publisher link of EasyExportMail on the top of this page to get more details about the vendor.